Keynsham and Bath Driving School. Experienced and patient driving instructor, offering quality well structured driving lessons in Bath, Keynsham and surrounding areas. 4 Hrs £60 plus 2 hours free if you book online. Over 70% first time pass rate, If you do not pass first time, we cover the cost of future tests worth £62 each attempt. We are now on facebook, if you like our website please follow us. First 4 Hrs £60, have an extra 2 hours free if you book on line. See my price list for details. To book online click the following link. 2. If you don't pass first time, we will cover the cost of future tests. 3. Driving lessons in Bristol (Brislington, Hanham, Longwell Green and Surrounding areas. 5. Regualar weekly time slot so you always know when your lesson is. 6. One to one training, no passengers. 7. Patient and experienced instructor qualified 1999. 8. DSA approved and CRB checked. 9. Paypal accepted, credit/debit cards can be taken in car. 10. Genuine reviews on this website. 12. Test results shown on this website. 13. Intoduction rate of £60 for first 4 hours. 14. Book online and have another two hours free. 15. On going progress chart so you will always know how you are progressing. 16. Help with theory on request. 1. Book on line using my booking form. 2. Text me 07775567251 let me know when you are free and what area you are in. Please do not phone as due to extreme workload I will not be able to answer. 3. 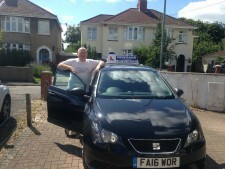 Email newmansdrivingschool@gmail.com let me know when you are free and what area you are in. Dave is an excellent driving instructor - he is extremely knowledgeable, supportive, calm and encouraging. I had genuine fun learning to drive with Dave and am so thankful for everything he taught me. My only regret is that I had to move away from the area before being able to pass my test. When I do eventually do my test, I will owe everything to Dave! Thank you so much for everything! Thank you so much for all your help with driving. I will definitely be recommending you!!! After 3 years off driving and on and off! I did a week intensive course with Dave! Today I did my test and passed first time! Highly recommend awesome driving instructor, very lovely and supports you throughout the whole thing! Couldn’t of done it without dave! Definitely will be recommending to a lot of people ?? Please see my Testimonials page for further reviews. To check out which areas I cover please go to my "Areas Covered" page. We are now able to take Payment via Paypal either through this website, or by secure chip an pin Paypal card reader in the car. We of course still welcome cash and cheques.